Chuckle. You can thank me later when the song is playing on repeat in your head. Doesn’t it make you crave a road trip though? 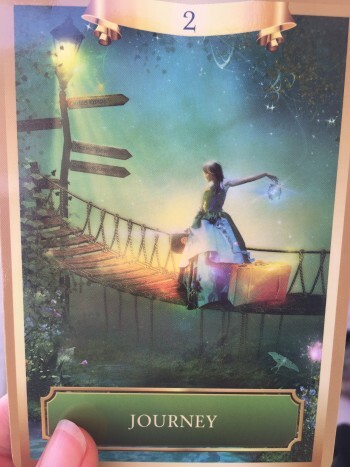 This card is a reminder that life is a grand adventure. If you’re feeling stuck in a rut, or like some of the magic and color has faded, then it’s time to shake things up. Book a vacation. Go camping for the weekend. Take a quick – or extended – road trip. Even if finances are strained, it’s important to pack your bags occasionally and head out to see the world. Whether or not you have travel plans, do something that feels FUN this week. Make a choice that has your heart beating a little more quickly. Dip your toes into a pool that’s just outside your comfort zone. Drive a different route to work or the grocery store and keep your eyes open for something new, something you’ve never noticed before. Eat a new food or try a new restaurant for lunch. Talk to someone you see regularly but have never had a conversation with before. Believe that you’re on the right path even if you have no idea where you’re going. Listen to the whispers and nudges that are your internal guidance system. Don’t worry about where everyone else is heading, figure out which direction you want to go. It could be off the beaten path or on it – there’s no right or wrong. Take a moment right now, close your eyes, breathe deeply and repeat after me: I invite joyful adventure into my life. I am open, ready and willing to have fun. May your journey this week bring you exactly what you need. P.S. Trust that you are exactly where you need to be in this crazy adventure called life. And if you feel really stuck, let’s talk. This entry was posted in Uncategorized and tagged adventure, affirmation, freedom, fun, intuition, magic, open, oracle, oracle card, trust. Bookmark the permalink.